Where has the time gone?? I'm trying to catch up on all that's happened in the last few months. Sofia is finally HOME and I'm attempting to catch up on her story God's story of how she came home. It's truly miraculous and how blessed am I that I get to be a small chapter in this story? On July 10 (my mom's birthday), God shared that I would be with Sofia for her birthday in August. I didn't know what that meant but I surely hoped that meant we were finishing court very soon. Unfortunately, a few days later I found out that nine months after NOC and five months after our case had been filed in the court system, we were back at square one. Our agency shared that our case hadn't even been heard in the courts yet and I was devastated with this news. Our sweet girl had been waiting years and she had to wait even longer. I was in a deep depression for a long time after that. A sort of darkness engulfed me as I pleaded with God to just let her come home quickly and yet my prayers went unanswered. God said, Not Yet. I ached for our precious girl to know that we were fighting for her and we wanted her to be home so badly and yet it was all out of our hands. That's the part of adoption that really stinks; feeling totally and completely helpless. That's the part of adoption where one should place their trust in God and know He's holding those little loves in His perfect hands. I didn't do so well with surrendering that part to Him but I do believe He used my stubbornness for good. He used it to fuel a fire that would enable me to do whatever it took to get Sofia home (more to come on that later). On August 20 I left for India to visit Sofia and try to get her case moving along. I am so thankful she lived in a Christian orphanage! Bethel has a community college, nursing school, elementary school, girls and boys home (for children whose parents can't afford to raise them), and some other things I'm sure I've missed all on 120 acres. It's such a remarkable place! I was able to see where she went to school, meet her friends and care takers, and basically see how she had lived for the last five years. She was SO loved there and I'm eternally grateful for that. The first few days were sweet as we played together and learned more about one another. By the middle of the week, her attitude had shifted. We found that the other kids were jealous and being mean to Sofie. Understandably, kids are kids and these precious ones had good reason to be envious. I came in bringing goodies for all of them, taking time to paint, color, build with play-doh, blow bubbles, throw balls, paint fingernails, gobble down candy and fruit snacks but I was Sofia's mama, not theirs. Talk about feeling WRECKED - many of those little loves had no Mama coming for them and yet I hurt knowing they took out their heart ache on sweet Sofie, who felt stuck in the middle I am sure. Her birthday went something like this -- just an excerpt from a Facebook post on our adoption page. "Yesterday was a very long day. 😥 we took all ten baby home kids to the zoo. Sofie wouldn't sit by me on the bus. The nannies kept making her sit by me and she cried the most pitiful cry. When we got to the zoo they were making her hold my hand and she didn't want to. They pulled her to the side and told her I came all the way to see her and she should be nice. I DID NOT want her to at all feel obligated. Finally Sofie told them some other kids at the baby home told her I was taking her away and they were happy she was leaving and they wouldn't have to go to school with them anymore. They had been teasing her and laughing when she cried. 😢The nannies told her not to listen to them and she seemed better for a few minutes. I just hate her birthday was like that. It was supposed to be a happy day. We have tried to do things with all the kids everyday.. chalk, bubbles, coloring, stickers to help keep from just showering our kids with attention and prizes but still they re hurting kids that need love. It just makes me sad for Sofie that she's being teased because they are jealous. During her party she got upset again. I then got upset after her party fiasco. I told them a small cake with her friends was fine. Half the village came. She got upset again. She didn't want to be near me. When the party was over I told the director we were going to a hotel tomorrow since its probably best for Sofie. I started crying (again) and at exact moment a thunder storm blew up and the power went off. It was like the party from hell. She left quickly I didn't even give her the gift which I ended up scaling back so she wouldn't be bullied even more. 😟 It breaks my heart that we don't know what those kids are telling her. Pray for our sweet girl!" The next two days I gave her some space and just played with all the babies. When it was time for me to leave, she seemed almost relieved that I was finally leaving and NOT taking her with me. ;) Bless her sweet bones! Knowing she was loved and not wanting to come home with me, made it easier to leave. On August 28 I boarded a plane to go home without my little love but I was more determined than ever to get her HOME FOREVER! It's been a weird and lonely season the past three months. All the summer clothes and shoes I bought for SJ are no longer needed. I can't bear to buy her anything else. Her empty bedroom is a reminder of a daughter who is still 9,000 miles away - a year later due to the ridiculous foreign judicial system. 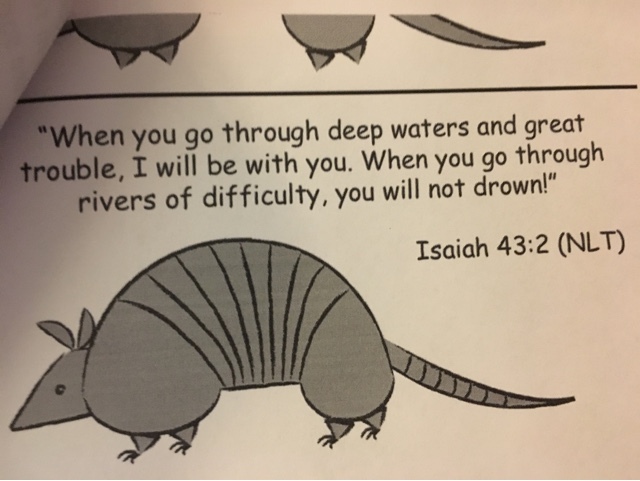 Doing lesson plans in preparation for maternity leave and I found this in an armadillo unit. Thankful that God sends me reminders of his faithfulness in the mundane moments. Back in early spring, the orphanage told us SJ's case had been filed in court - five months ago. Our caseworker called this morning with gut wrenching news. Our case hasn't even had it's first hearing yet. Basically the case I've been following for the past five months that I thought was ours is not. Upon hearing this, I cried my eyes out in the craft section at Walmart while Ryan rolled duct tape down the aisle and made duct tape towers, blocking the aisle (sorry Walmart shoppers). One of the roadblocks we are facing right now is a hold up in the legal system. There is absolutely nothing anyone can do on our behalf - not our agency, not CARA, not the orphanage, certainly not us. Only GOD can turn this around and our prayer is that he will in some supernatural and miraculous way but this doesn't mean I'm not angry, frustrated, and hurt. Not because I'm being denied what I want but because there's a little girl 9,000 miles away that has been waiting for a family for five years. I know God doesn't want her to grow up without a family and I can't help but wonder why is she still waiting. 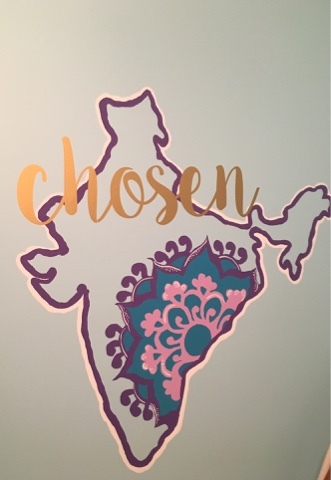 Why are we not going to India yet? Why does she have to see the caretakers she loves as parents leave and we can't be there with her to comfort her and just bring her home ? Why must she wait, needing surgery (to fully extend her arm that's been stuck in a right angle position all her life) and not be here where she can receive the best care? Why isn't God answering prayers to bring her home now? We've been faithful to obey, stepping out in faith to adopt (for the second time, from one of the most difficult countries in which to adopt) ...........and still she waits. Five years without a family isn't right when we are HERE and we are READY. We've asked again and again and and again and still she waits. So many of our friends and family have prayed on her behalf. (And we thank you!) She will be celebrating her fifth birthday in a few weeks without us. In fact, all of her birthdays have been without a family. I can't imagine how she must feel and how she must wonder why we haven't come yet. I bought her new summer clothes, sandals, PJs and much of it she won't be able to use because summer is ending and well, in about 6 more months she will be much bigger. To answer all the whys.. SATAN - that's why. He is the reason children are orphans, he is the reason the judicial system gets clogged up with prideful people, he is the reason children wait needing life altering surgery, he is the reason adoption has become an overly complicated process. The devil comes to steal, kill and destroy and the battle we are fighting is one against him and those that are influenced by his evil ways. While God has a plan for SJ's life, so does Satan and that's what makes my heart sick. I know God will prevail as we fight as hard as we can for this little girl 9,000 miles away. God's word says the battle belongs to Him. Not to me, not to lawyers or judges, not to those caring for the least of these. The battle belongs Him. I'm trying to let that soak in but it's just really difficult. In other news, SJ's bedroom is about 98% complete and if she isn't home soon, I may buy every type of hairbow known to man, in every color of the rainbow, from Amazon.com as you can see in the photo below. Yeah, ooops. I hope she likes hair accesssories. We are currently entering our fifth month in court and praying we see the light at the end of the tunnel soon. This adoption has taken nearly two years to complete. Two years of paperwork, praying, waiting, wishing, dreaming, more praying, even more paper work, plenty more waiting. Every twist, turn and delay has pointed right back to our girl. 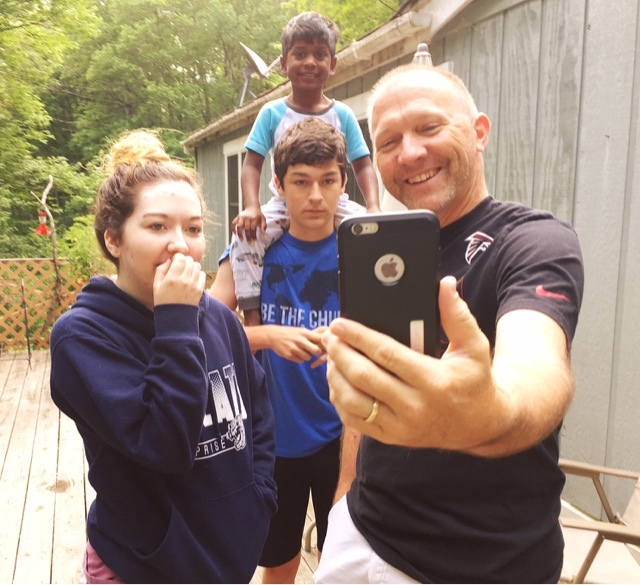 We started this adoption with a God sized goal - all five of us would go to India and come home as a family of six. Since we hope to visit Ryan's birth city and orphanage as well, we wanted Katie and Braden to see where their siblings were born and experience their culture first hand. One day we won't be on this earth anylonger but the little ones will have their older siblings to answer questions about their culture and recall their time in India. We didn't know how a trip like this would be possible but we prayed, saved, fundraised and God made it happen! It still blows my mind that the God of the universe cares about little me and my minuscule problems. He provides in ways that are unimaginable. While he may not answer them how we would like, he hears every single prayer. You see, my husband purchased a cancer policy 19 years ago. Sometimes it pays for things and sometimes it does not. We were blindsided by God's provision. God took something meant for evil, and turned it into something good - oh so good. A total Genesis 50:20 moment! This girl has such an amazing story and we can't wait to share all the details with her! It has drug out over the last five months and it seems to be never-ending. I've been clinging to this song the last few weeks and remembering He is good. Since we have received NOC and our case has been filed in court, I get the question several times a week - when will she be home? I surely wish we knew! We are praying she's home by summer but we know to expect the unexpected in the adoption world so that's only a hope and a prayer right now. God placed adoption on my heart as a child. I had this idea that I could go into an orphanage in any city and just pick up a child and bring her home (yes, HER). Apparently I watched Annie a time or two as we all know orphanages don't exist in the U.S. Scott and I talked and prayed about adoption for ten long years. We didn't wake up one day and say, hey the cool thing to do is adopt, so how about we do that like... tomorrow! We talked about it extensively - we discussed adoption when the tsunami hit southeast Asia in 2004 taking the lives of over 200,000 people, we talked about it when the earthquake devastated Haiti in 2010 killing over 150,000 people and leaving countless children orphaned, we talked about it when people we knew were facing a crisis pregnancy. 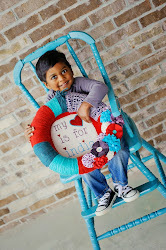 In April of 2012 we stepped forward in faith with plans to adopt a toddler girl from India. For several months we are filled with so much excitement about who she would be but God had other plans. Instead he sent a precious BABY BOY to us and I can't imagine a second of our lives without him. Before we even left India to bring Ryan home, Scott and I both knew we would soon adopt again and this time we would find our daughter. Nearly two years ago we started the process and six months ago we saw her sweet face for the first time. The daughter God told me would come our way from the womb of another mother, the daughter we officially started searching for when she was just eight months old, yet through a series of detours took a little longer to find, the daughter that's waiting for us so patiently. Please pray with us for a smooth and quick court process - for all the evidence to be ready and for sweet SJ to find favor with the judge and the advocates working on our behalf. She's been living in an orphanage for 4.5 years and while it's evident she's loved so very much, we are just anxious for her to be home with her family. Pray with us for God to continue to move in a supernatural way so that the only explanation for any of it is just simply HIM. In other news, we have completed our SHOE DRIVE!! We collected 10,540 pairs of shoes and yesterday we loaded them all up in the truck sent by Angel Bins. The driver will come in the morning to take them all away (yaaayyyy!!) and I will finally be able to park in my garage again. :) We sincerely thank every person who helped us collect shoes by sharing info about our shoe drive, cleaning out closets upon closets and dropping bags of shoes on our porch, at our church and through friends. We couldn't have done it without your help and we are very grateful! We had a pretty good system set in place and it only took about 3 hours to load and stack all the bags. Scott is a beast! Thank you all for supporting our family and thank you for praying with us while we wait for SJ to come home. I have really been so bad about blogging sister's journey. We are plugging along but the home study update took so long, which led to delays with the i800 supplement and then the i800. We actually forgot to sign one of the forms. :( I mean, who does that?!? I was growing so weary of the months it took to get our immigration approval but it finally happened in mid-January. Once that was complete we could apply for Article 5 which is the catalyst for India to begin their side of things. We received that January 25 and we were hopeful to receive the coveted NOC (No Objection Certificate) in a few months. It took nearly four months to get Ryan's NOC so we knew we could possibly be in for a long wait. Sister's came via email, five days after Article 5. FIVE DAYS Y'ALL!!! It all happened in the midst of some heavy spiritual warfare. We were at the culmination of our Both Hands Project and satan was relentless. BUT God provided miracles in our adoption (we got NOC days instead of months!! ), He provided miracles with our Both Hands Project widow (she prayed to receive Christ), He is mending hearts in our family and He is good! Even when we don't understand his ways, He is good. Even in the waiting, He is good. Even in the hurting, He is good. Even in the exhaustion, He is good. I just can't top any of this right now. Tonight I am going to bed with a thankful heart. We are one step closer to our sweet girl - AND we can finally send her a photo book of the family she's been waiting four and half years for! Next up - our court date(s) to declare that we are her parents and then it will be time to go to India!